Hot chicken is a blood sport in Tennessee, where chile-heads with death wishes line up at Prince’s on the outskirts of East Nashville to see God in a few bites of cayenne-rubbed poultry. With its two central locations and inviting picnic tables, Hattie B’s may not have the same journey-to-mecca appeal. But the place certainly brings the pain with its hot chicken, available in five degrees of heat. On Sundays you can order your choice of bird on a waffle, sweetened with Log Cabin maple syrup or a bit of clover honey. Executive chef John Lasater says he splits the difference between his grandmother’s waffle recipe and one Thomas Keller popularized, folding a fluffy meringue into the batter to keep it all airy and light. 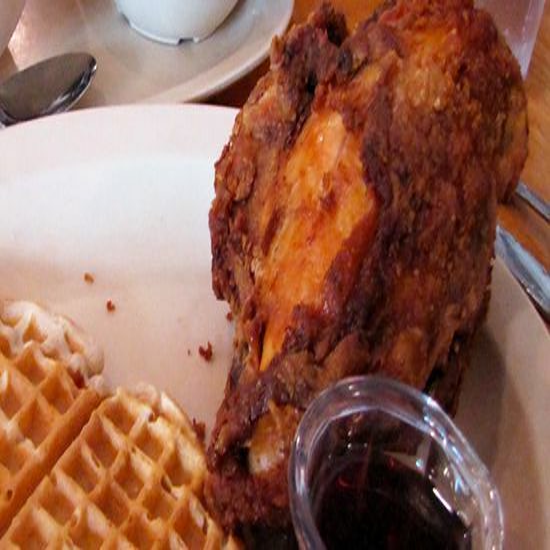 “The savory chicken, the buttery waffle, the sweet sugar of the syrup—it’s magic,” he says of the popular dish, which will be even more accessible in 2016 when Hattie B’s expands with a Birmingham outpost and a third Nashville location in Germantown. As much a Hollywood institution as that iconic sign in the hills, Roscoe’s has been name-checked in the pop-culture output of everyone from Quentin Tarantino to Notorious B.I.G. Having fallen for the soulful coupling of crispy bird and eggy waffle at Wells Supper Club in Harlem, Roscoe’s founder Herb Hudson set up shop on the corner of LA’s Sunset and Gower in 1975. Today there are six locations in addition to the Hollywood original, each serving a lineup of assorted chicken parts—legs, thighs, wings, even livers and giblets are available—with a waffle pressed in a maple syrup-glazed iron. President Obama made an unscheduled visit to the Mid-city outpost in 2011; he went for the three-wing “country boy” special, since re-named in his honor. If Herb Hudson is the fellow who took chicken and waffles out of Harlem, then Marcus Samuelsson is the one who brought it home. He returned the dish to its old stomping grounds when he opened Red Rooster on Malcolm X Boulevard in 2011. Chef de cuisine Adrienne Cheatham says the restaurant serves different iterations of the classic dish; the current version, inspired by Nashville’s hot chicken tradition, is tossed in a combination of house hot sauce and something called spicy chili crisp—a blend of fried shallots, garlic and chiles—with a bit of the fryer oil to keep it glossy. The waffle is spiced too, with a warming mix of cinnamon, ginger, nutmeg and allspice, but the syrup is the coup de grâce: It’s blended with reduced bourbon and spiked with even more chiles. “Every bite is the perfect bite,” Cheatham says. Jeff McInnis has a lot to say about the Winston pressure fryer—designed by Colonel Sanders himself—that defines the chicken at the restaurant he owns with partner Janine Booth. It certainly makes for a beautiful bird, finished with a dehydrated lemon salt that supplies Root n Bone’s proprietary zip. 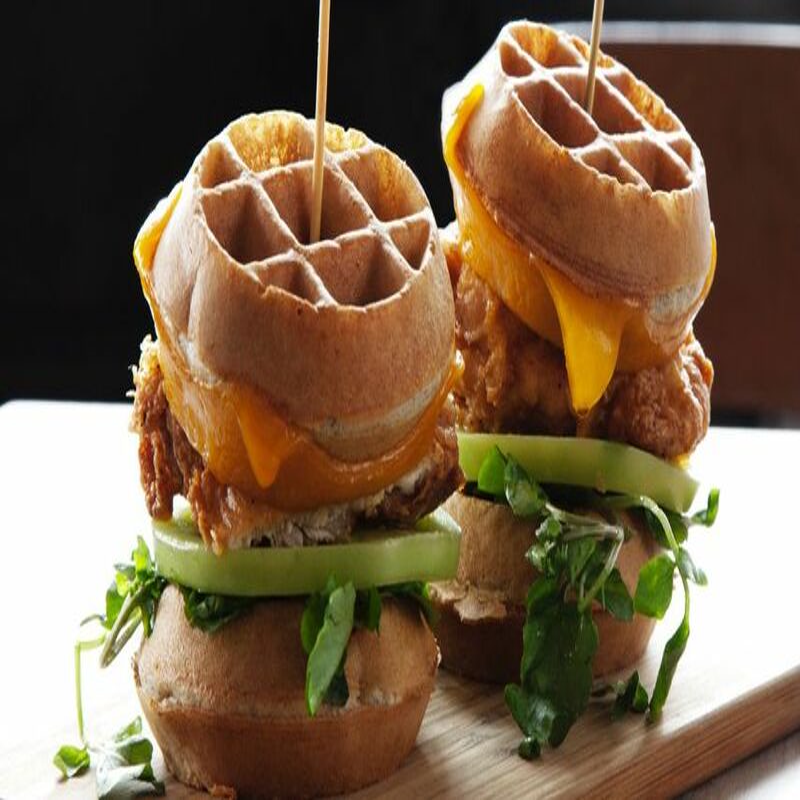 The chicken is great on its own, but it takes on new dimension over a buckwheat waffle with melted cheddar and bourbon-enhanced maple syrup. The chicken and waffles is available every day on the dinner menu, but for the full experience, go for the daily brunch, when you can get it as a waffle sandwich with watercress and pickled onions, okra and cucumber. Since forever, the NYC-based Momofuku empire has been associated with pork (pork buns; the roasted pork shoulder bo ssam; the pork belly ramen). But these days, David Chang’s restaurants have become the champions of fried chicken. There are the high-rising platters of Korean and Southern-style fried chicken at Momofuku Noodle Bar; the spicy chicken sandwiches for which people line up at the storefront Fuku. And at brunch at Ma Peche in midtown, there’s well-crusted habanero-infused fried chicken, alongside yeasty waffles. The fried chicken has a slow burn; if you’re still craving more, they sell it by the bucket as well. 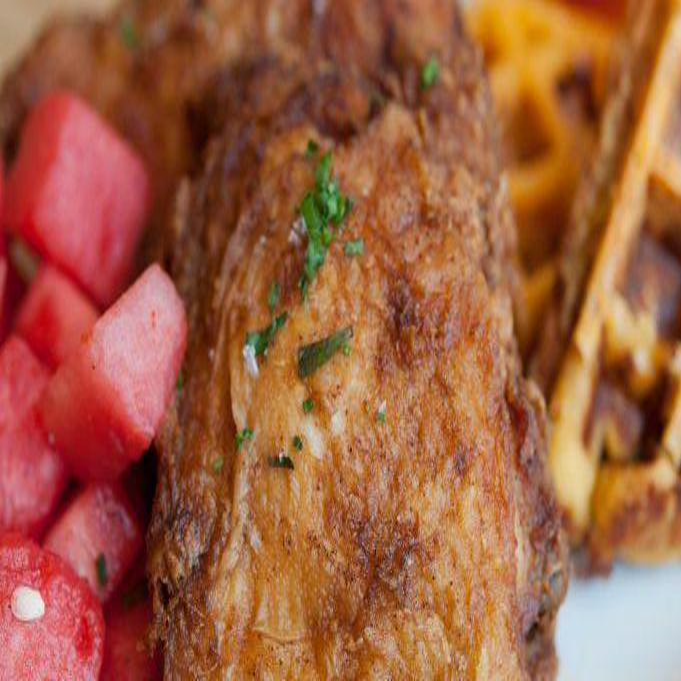 For some people, fried chicken and waffles is a weekend brunch dish. Others could eat it every day of the week, for lunch and/or dinner. Yardbird is firmly in the all day, every day camp. The menu here is dedicated to creative Southern cooking, from fried green tomato BLTs to shrimp & grits with PBR chicken jus. And then there’s the exceptionally crispy chicken & waffles, served with sharp cheddar cheese waffles and bourbon maple syrup. It’s on the menu for lunch, brunch and supper. If Yardbird were open for breakfast, surely it would be served then too.